We’re excited to announce that the Kiwanis Club of Marietta, Ohio, is the winner in the 5th Annual Legacy of Play contest. The club, which will receive $25,000 in playground equipment, plans to renovate the community’s nearly 30-year-old playstructure to make it inclusive for the entire community, giving children of all abilities a safe environment to gather outside to socialize, grow and play. Marietta is a historic, charming riverboat town nestled in the rolling hills of the Mid-Ohio Valley. The city served as the starting point for westward expansion by early pioneers, and the design of the all-inclusive Northwest Territory Community Playground will pay tribute to the area’s first settlement. From themed and inclusive playground equipment, embedded historical facts and an artifact seek-and-find activity, adults and children in the community will have the opportunity to learn about the area. We’re excited to see this inclusive playground vision come to life over the next year. The Marietta Kiwanis Club hopes to complete the Northwest Territory Community Playground on or around Kiwanis One Day in October 2019. Stay tuned for updates along the way. A fourth grader who uses a wheelchair will soon get to play on the playground with her friends. Her story helped convinced a panel of judges to award the Mankato Downtown Kiwanis Club $25,000 worth of inclusive playground equipment in the Legacy of Play Contest, sponsored by Landscape Structures Inc. and Kiwanis International. The award will be used to develop the Fallenstein Playground, an all-inclusive playground where children and families of all abilities can develop, discover, laugh and experience the joy of play. Mankato, 75 miles southwest of Minneapolis, is renowned for its great parks and trails, and offers breathtaking landscapes of rivers, lakes, ravines, bluffs, natural prairies and forested areas. With a population of nearly 41,000, Mankato offers small town living in a thriving regional center. The all-inclusive Fallenstein Playground will be located adjacent to Fallenstein Field, the fully accessible baseball field used by the Miracle League of North Mankato, in Caswell Park. The Mankato Downtown Kiwanis Club will complete its inclusive playground project on or around Kiwanis One Day in October 2018. Learn more about the project. Dreams becoming reality in Ottawa, Ill. Earlier this year, we hosted the Legacy of Play Contest along with Kiwanis International to bring a playground to a deserving community. The winner of the contest was the Kiwanis of Ottawa, Ill., who received $25,000 in Landscape Structures playground equipment. Ottawa, Ill., is home to more than 18,500 people, and 13 percent of the community’s children live with a disability. However, Ottawa does not have a park that welcomes children of all abilities. In order to change that a group of volunteers founded PROJECT INCLUSIVE, and their first project was to build an inclusive playground in an existing city park. The goal of the project is to reimagine an area that fosters relationships, family and pride—allowing PROJECT INCLUSIVE to shine for all members of the community. Now, six months after the Legacy of Play Contest award was presented to the Kiwanis of Ottawa, Ill., the group is well on their way to making their dream a reality. PROJECT INCLUSIVE is developing the project in two phases—first, the freestanding play components and second, the inclusive playstructure. And if all goes as planned, the community of Ottawa will have the start of their inclusive playground by early next summer! In June, we awarded the Iola Kiwanis club in Iola, Kan., $25,000 in playground equipment as part of the Make a Difference Through Play contest. We’re happy to share another update from Michael Ford, member of Iola Kiwanis and community resource officer for the Iola Police Department. Our last update was in mid-December, and plans for our inclusive playground have been moving fast since then. Our fundraising got a big boost at the end of 2013 through a couple of grants and individual donors, and now we’re moving quickly towards the installation. We’re hoping to install the playground on April 5-6, during Kiwanis International’s One Day—weather depending, of course. And will build the playground with the help of community volunteers. Groups within the community have come to us to ask if they can participate. We’ve got volunteers from a local bank and church, the police station, the M.O.M.S. group as well as their friends and family, and the Iola Kiwanis Club. Even more than helping with the manual labor, people are offering to help with lunches and even the Girl Scouts are hoping to be there to help cheer on the rest of the volunteers. Our playground consultant from ATHCO, L.L.C. and the Iola Parks and Recreation Department have helped coordinate the installation, and we’re targeting a two-day build. Following the build, we’ll tackle the site work and surfacing installation. Everyone in Iola—from kids to adults—is excited to see this project come together and looking forward to playing on the inclusive playground this spring. 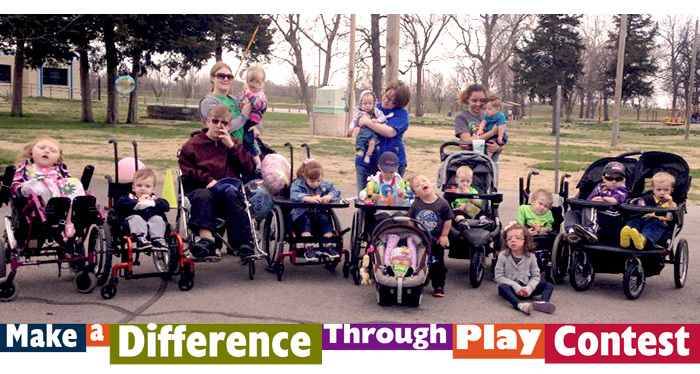 Iola Kiwanis club in Iola, Kan., is the winner of the Make a Difference Through Play contest! They won $25,000 in playground equipment from Landscape Structures for their essay submission describing why their community needs a new playground. The City of Iola is situated along the Neosho River in Southeast Kansas. With a population of nearly 5,700 residents, Iola is the largest town in a tri-county area. The City’s main recreation space, Riverside Park, is home to many amenities including a pool, athletic fields and a playground. The $25,000 award will allow the opportunity to create a playground that will accommodate children and families with special needs. The Iola Kiwanis club is collaborating with other local organizations—M.O.M., Iola Pride Committee, Iola Wal-Mart volunteers and many more—and plans to install a safe and inclusive play environment that will welcome all abilities. The Iola Kiwanis club will complete their inclusive playground project on or around Kiwanis One Day, April 5, 2014. One Day is Kiwanis International’s signature day of service during which many clubs participate in service projects benefitting their local communities.